Many road trippers head into the Southwest with a single mission: to see the Grand Canyon. They are so intent on looking out over the Canyon's grand vistas that they skip other attractions along the way. Suzanne and Craig Sheumaker have a different mission: to introduce four of the Canyon's close neighbors and give visitors reason to pause a little longer in this extraordinary region. What was the reason for these ancient, carved images? Did they have spiritual significance, point the way to great hunting grounds, memorialize major events? Or were they graffiti? Enjoy and ponder! Giant trees once covered a lush Southwest landscape. Today their broken remains, turned to stone, lay on a desert floor, beckoning you to look closely at their colorful, crystallized centers. 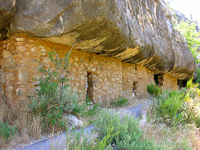 Between A.D. 1100 and 1250, stone-and-mortar rooms were tucked into canyon walls to house several hundred Sinagua Indians and provide ample storage space. Today, you can walk alongside them! Virtually every mountain you see from here is volcanic in origin - part of the San Francisco Volcano Field that covers 1,800 square miles. 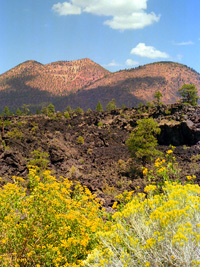 Sunset Crater is the youngest of 600 volcanoes. This is just one section of an apartment-style building preserved behind the park's visitor center. Constructed after the eruption of Sunset Crater, it was surrounded by rich farmland layered with volcanic ash, which retained moisture and nourished crops. Among many Native Peoples, ball games served as vital links between friends, neighbors and traders. 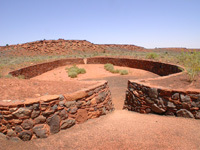 The original ball court at Wupatki - the only known masonry court in the entire Southwest - has been faithfully reconstructed. Cool! Something strange happens when travelers approach the Grand Canyon. At the prospect of seeing America's greatest scenic wonder, even the most leisurely road tripper turns into a roadrunner. Do yourself a favor: Slow down. Why go barreling across Interstate 40 in Arizona, ignoring the road signs for Petrified Forest National Park and Walnut Canyon National Monument? Why speed north on Highway 89 from Flagstaff, bypassing the turnoff for Sunset Crater Volcano National Monument and Wupatki National Monument? When you learn what you have missed, you might kick yourself. These four attractions are national treasures in their own right - exceptional for their historical and geological significance as well as for their often-startling beauty. Located just off the main route to the Grand Canyon, each makes an easy - and very satisfying - side trip. Trees that turned to stone more than 200 million years ago are the focal point of this very unusual park, but they're not the only attractions. Your visit will begin with a drive through a picturesque swath of the Painted Desert -- a rainbow-striped terrain of eroded hills and expansive grassland. Be sure to stop at the visitor center to see the fossils of prehistoric reptiles that roamed this region when it was a tropical river basin. 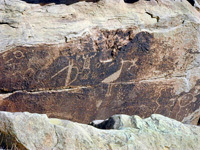 Then continue along the park road to the remains of much more recent human activity at Puerco Pueblo, where you will find well-preserved rock carvings. An easy path enables you to see where the Ancestral Pueblo people pecked intricate petroglyphs into large boulders 600 to 900 years ago. Still ahead of you is the once-lush, now-petrified forest that gives the park its name. At first glance, the site might not seem like much -- just a scattering of huge, broken tree trunks across a dry landscape - but don't let this deter you. Get out of your car and examine individual logs up close. Their interior beauty is so glorious you might almost understand why souvenir hunters once dynamited petrified trees to get at their brightly colored, crystallized centers before the national park system took control. In total, the drive through Petrified Forest National Park is only 28 miles, but plan on it taking about two to three hours with the stops. Native Peoples settled in this rugged high country around A.D. 600 and remained for roughly eight centuries. They first lived in one-room pit houses on the rim of the canyon and then moved down into the canyon walls, building approximately 300 stone-and-mortar rooms within the natural recesses. Today, on a convenient, forested trail out of the visitor center, you can walk to some of the rim-top sites and alongside 25 of the canyon rooms. Here human history feels very tangible. Look for ancient fingerprints pressed into the clay mortar during construction. Note the smoke-blackened stains from cooking fires that burned more than 700 years ago. See the T-shaped entryways that were designed to control the airflow through some of the rooms. Also gaze out across the canyon to other walls and other ruins. Altogether, several hundred people lived here at one time. Why did they move into this canyon when water was not close by and the only nighttime light came from small fires? Your walk to discover the answers will be less than a mile round-trip. Although a bit strenuous, with 240 stairs back to the visitor center, it's worth the effort. In geologic time, this area is young. Sunset Crater, which rises 1,000 feet above the surrounding landscape, was formed during a series of volcanic eruptions beginning around A.D. 1064. The Bonita lava flow gushed from the crater's rocky flanks around 1180 and spread out at its base. A final burst of activity in the 1200s painted the upper portion of the otherwise black monolith with bright red, orange and yellow cinders that reflect a rosy glow at sunset. Today this fascinating area remains an inhospitable environment, although some trees and wildflowers have managed to gain a foothold. Begin at the visitor center, where you will learn about volcanoes and earthquakes and their impact on the local people. Then walk the one-mile loop trail over a now-solid river of black lava that once undulated, bubbled and exploded into fantastical shapes. You will see a squeeze-up (created when molten lava oozed like toothpaste through a crack in hardened lava), a spatter cone (built up around a gas vent), jagged aa lava, smoother pahoehoe lava and much more. NASA used this volcanic terrain to test a lunar vehicle before the 1972 Apollo 17 mission to the moon - a testament to its otherworldliness. You can reach this remarkable red-rock destination via a paved road over the Sunset Crater lava flow. Back in the 1100s, Native Peoples migrated away from the volcanic activity to this safer valley, establishing rich and influential communities that reached out to thousands of people within a day's walk. At what is now Wupatki, the inhabitants built a 100-room pueblo (easily accessible just behind the visitor center) and nearby satellite settlements (also easily accessible). 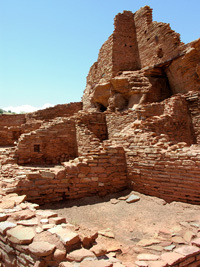 With its large amphitheatre and ball court, the pueblo was clearly an important cultural center -- a link with distant trading partners as well as between neighbors. As you stroll, imagine the sounds of children playing, crowds cheering at the ball game, and traders exchanging local goods for turquoise, shell jewelry, copper bells, parrots and other exotic items. These four national parks and monuments are the Grand Canyon's captivating neighbors. 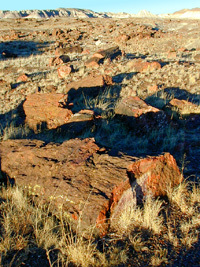 Petrified Forest and Sunset Crater are scenic delights. Walnut Canyon and Wupatki are among the historical destinations featured in our travel guide, America's Living History - The Early Years. All four are open year-round, as is the South Rim of the Grand Canyon. (The North Rim is closed from mid-October to mid-May.) We hope you will take the time one day to visit these sites and enjoy their exceptional heritage. Suzanne and Craig Sheumaker, a husband-and-wife team from California, have a long history of exploring and discovering. Suzanne is a professional writer who began her career promoting world travel, went on to other topics (primarily heath care), and then returned to travel writing in recent years. Craig is a professional graphic designer and commercial photographer. While searching out scenic locations for Craig's stock photography business, the Sheumakers became intrigued by the many historical places that bring America's past to life and make history meaningful in today's world. They picked their favorite pre-1845 destinations to showcase in their specialty traveler's guide, America's Living History - The Early Years. Craig is also a RoadTrip Advisor on RTA's Great American RoadTrip Forum.